It’s got the X-mas Factor – that’s the verdict from one famous music mogul for the new charity single released by an NHS Trust. 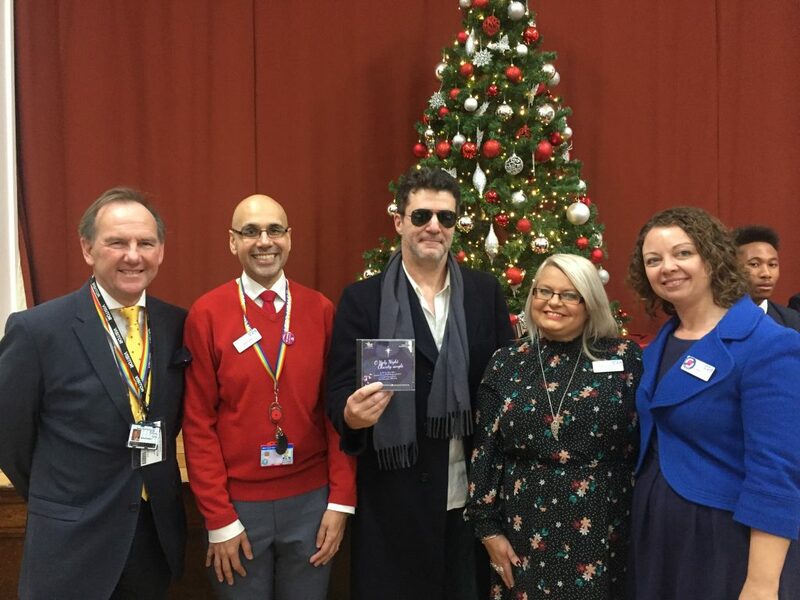 X-Factor judge Simon Cowell made a special appearance at the launch of O Holy Night, performed by The Heartbeats Choir at an Oldbury school – or so it seemed. In fact it was Dudley-based lookalike Andy Monk who attended the official first performance of the single, which has been recorded in conjunction with Bristnall Hall Academy, and Your Trust Charity, which is run by Sandwell and West Birmingham NHS Trust. The song was released on Monday (November 26) and will go head-to-head with the winner of this year’s hit TV show X Factor and other chart-topping artists. It features the vocal talents of students, teachers, school governors, Police Community Safety Officers, healthcare workers, and local celebrity Kash “the Flash” Gill, four-times world Kickboxing champion. There was also support from Baggie Bird, the West Bromwich Albion mascot. Cash raised from sales will go towards enhancing the experience of patients, visitors and staff to Sandwell, City and Rowley Regis Hospitals, which are run by the Trust. The idea was conceived by Amanda Winwood, Fundraising Manager at Your Trust Charity and record producer James Callaghan has worked on producing the single. Amanda said: “We are so excited about the release of our single O Holy Night. We performed it for the first time today to an audience and we received a great reception. “Simon Cowell even turned up and gave it the thumbs up. “I want to thank everyone involved in the project which includes the staff and students from Bristnall Hall Academy, the local Police Community Safety Officers, and our NHS colleagues. “It’s a heart-warming song which we are releasing at a joyous time for a very worthy cause. “Every penny raised through sales of this single will go straight towards helping our charity enhance the patient experience our Trust is known for. James, who works as sound designer for the BBC show Doctor Who, added: “As a former pupil of Bristnall Hall it was an honour to take on the challenge of composing an arrangement for this classic Christmas song. To download the single go to your music provider such as Apple Music, iTunes, Google Play, Amazon, Spotify and search The Heartbeats Choir. Or you can pick up your limited edition CD by contacting Amanda.winwood@nhs.net.